I’ve always wanted to see a major motion picture about Noah’s ark on the Big Screen, so when I first heard Hollywood was making a movie about Noah, I was psyched! I couldn’t wait for it to come out. The Genesis account of Noah’s ark is a favorite of mine, and I’d love nothing more than to direct the movie myself. But as word about the content of the movie began to spread, my excitement melted into disappointment in a hurry. To be honest, at this point I’m in no hurry to see the movie, if at all. Early audience testing was especially negative, and director Darren Aronofsky didn’t care. He’s a self-proclaimed atheist and was intent to put a very pagan spin to the movie. 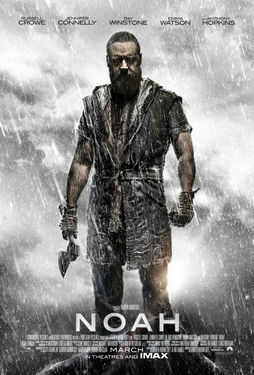 In fact he calls Noah, “the least biblical, biblical film ever made.” That about sums it up. This is troubling because the Bible says that Noah found favor in the eyes of the Lord because he was a righteous man, blameless among the people of his time, and he walked faithfully with God (Genesis 6:8-9). But the movie has turned this Biblical story upside down. Here’s what people who’ve seen it are saying: Noah is a psychopath who wants to wipe out all of humanity because they’re destroying the environment. There’s a clear anti-human agenda, and it makes a mockery of the Bible. The only innocents in the movie are the animals, and Noah doesn’t even want his own family to procreate. His major moral conflict is whether or not to kill his family. The true villain in the movie was the one who believed God’s command to subdue the earth and have dominion over the animals. And the movie itself is very boring. God isn’t even mentioned in the movie; instead God is referred to as the “creator” so that it becomes a more “universal” story. However there are plenty of Biblical movies that have been made in the past that have been successful, and most have had more respect for Christianity and the Bible than what this movie has provided. At this point I don’t intend to see the movie anytime soon. I’d be delighted if this movie bombed. I’ve never said that about a movie before. But I’d hate to see its success serve to advance an atheist agenda hostile to the Bible. For those who decide to see the movie, my best advice would be to read the account of Noah’s ark in Genesis before and afterwards (Genesis 6-9). Having a real understanding of the historical Noah would prove helpful and help combat the anti-Biblical Hollywood representation. Yes, no reason to waste any money on this film. It’s far from what they’re advertizing.